Are you someone whose career or lifestyle is about helping others? A therapist, a social worker, a teacher, a nurse? A parent? Sometimes, when our focus is on others, we lose sight of our own creative purpose, that part of us which is not about pleasing others, but about finding and using our own voice. If you’d like to hear Dermod talk about this course on a podcast, please listen here. Creativity for the Caretaker is a twelve-session course on Saturday mornings in Capel Street, Dublin. It was first run in Autumn 2015, and you can read the lovely feedback here from participants. Based on Julia Cameron’s The Artist’s Way and its companion book, The Artist’s Way at Work, the course will be designed around your needs for creative expression – writing, drawing, whatever it is that you’ve been neglecting. It will be a supportive space to encourage you to ring-fence a dedicated time in your life solely for you and your creativity; to be encouraged to ask for help in keeping that time sacred, from your friends, colleagues and family. This course won’t be a critical skills-oriented workshop; unlike a writing class or workshop, for example, where your output is critiqued with a view to polishing up your craft, this will be more about looking at the many ingenious and plausible excuses you have come up with to prevent you doing what you know you “should” be doing, in the best possible sense. It is assumed that you have a skill; it is assumed you have a long-ignored passion; it is assumed you know what you are doing. If what you are lacking is the confidence/encouragement/belief to get “stuck in” and do it, then this course is for you. I signed up for a course but undertook a journey! 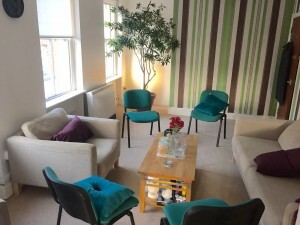 Although I’m a psychotherapist, the course is not a therapy group; we will, however, be working to create a safe, enjoyable, and supportive space for each other to take risks. We will also be looking at how our “inner critics” operate, those voices inside us that tell us we’re being selfish and indulgent, that we’ve no talent, that it’s a waste of time to do the thing that brings us the most joy. In my seventeen years practice as a psychotherapist, this is a workbook that clients have repeatedly found useful. Granted, it has to be translated from Californian, but, in essence, the tools are sound and effective, there’s nothing flaky about them. If you don’t have a copy yourself, let me know, and I can order one for you, or you can order it from Amazon here. I have been a participant in a twelve-week course in The Artist’s Way at Work in the noughties, in London. And I was also a member of an eight-week course called Overcoming Creative Blocks in the City Lit, London, in the 1990s. The issue of working through creative blocks is something I work with regularly with my clients. And it is something with which my core training, psychosynthesis, works very well. The course is on twelve Saturday mornings, 10.30 am to 1pm. It will start when there is a group of six people willing to start the journey, and will be organized using Doodle, which is a way of allowing course participants to pick online from a selection of offered dates and times. This way, the course may take much longer than three or four months to complete, especially taking into account summer holidays, but at least everyone, at the time of choosing the dates, would have indicated that they would be available to attend. Once committed to these agreed dates, I’m afraid there can be no refunds for missed sessions. I am sorry, this course is not open to those with reduced mobility, as there is no lift to the office. The group size is limited to six participants. It was the ideal size for the first group, and therefore I’m going to stick with it this time around. The only requirement is that you have a creative life that perhaps you’ve neglected, and that you spend most of your time looking after others’ needs, in whatever form that takes. All ages and professions are welcome. Please see the feedback from participants on the first course. CPD certificates will be issued at the end for those who require them. (30 hours). The full cost of the twelve weeks is €500, and can be paid in three instalments: €100 deposit, and €200 on both the first session and the fifth session. Alternatively, if you’re able to pay in full by the first day of the workshop, after booking with the deposit of €100, you may then pay a balance of €350 on the first session, making it €450 in total. Please email me here to book, and if you have any questions. Please do not book this course if you don’t have Saturday mornings free generally. Once we get going, we will work out a support network to help you, should you be unable to attend one of the mornings. You may pay the deposit online, just email me and I’ll send you an invoice with details on how to pay; all methods of payment are accepted! Naturally, if the starting date is delayed too much for your requirements, while the group forms, you will be entitled to a refund. The timing of this course will depend on enough like-minded people to coalesce and agree to a schedule together. It’s very organic, and I trust that when it’s right to start, it will happen! Dermod Moore is a psychotherapist, supervisor, and trainer of students of psychotherapy. He was also an actor (with the Abbey, in the eighties), a Speech and Drama teacher, and was a columnist for Hot Press magazine for 18 years. A collection of his articles was published in 2005, Diary of a Man. 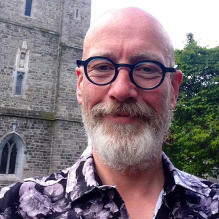 On returning to live in his native Dublin in 2006, he has largely immersed himself in working as a therapist and teacher, which he enjoys very much. Bearing in mind the old adage “the plumber’s tap is always dripping”, he has decided to offer this course not only to have fun and pay the rent, but as a way of examining his own considerable capacity to procrastinate; his teaching style is participatory, inclusive, and, hopefully, fun for all. Interested in other courses? Please see here!